1. The size is small and weight is light( 520kg) making the van carry more service tool and tire. 2. The demount tool can fast reach outside of the mount/ demount similar to the operation indoors. 3. 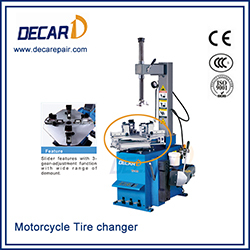 The process of mount/ demount is fast and simple, similar to the operation methods of the fixed truck tire changer. 4. The weight of the console is only 8.5kg and there is the spring to protect the cable outside of the console avoiding the damage to the cable. The diameter of the spring is very small decreasing the dangerous for sliding down to the minimum. There is the emergency stop button on the console. 5. The bead breaking arm has 3 positions providing more choices in the process of breaking up the bend. 6. After the tyre changer retracts back to the inside of the van, you can use the lock device to fix the rotation device to guarantee the tire changer on the van avoiding the damage to the van and tyre changer. 7) It is equipped with the emergence manual pump securing the tyre changer can be retracted back to the inside of the van when the electrical power supply is cut off. Each valve is identified with the color. And it is equipped with the renovational lock device with the help of the reasonable design of the manual pump to make it enough to operate the emergency operation by only one operator. 8) It can mount/ demount the tire with ring and the super single tire with the bead breaking disk. 9. Rim clamping cover ( Standard) prevents the rim from being damaged in the process of tire changing.